My son asked me to post this photograph as this was his favorite image of my Saturday Street Shoot in rainy old town Nuremberg. 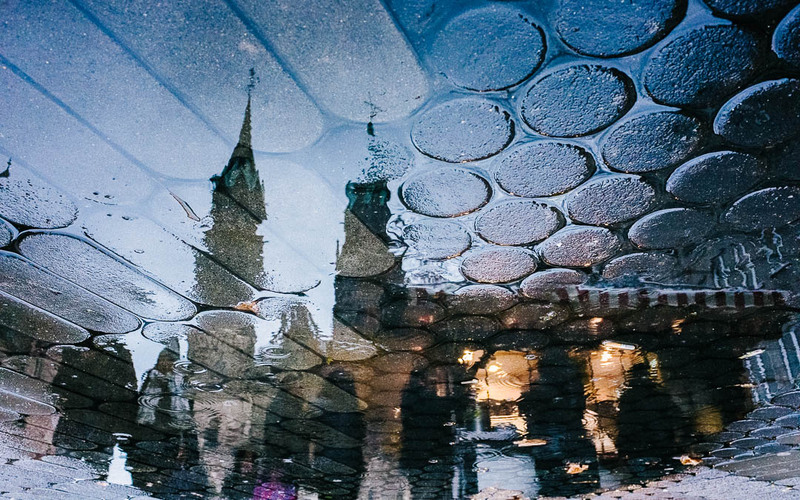 These are reflections of Nuremberg’s Sankt Lorenz Church and of a Bratwurst Hut on the wet cobblestones of the Karolinenstrasse. I photographed this puddle reflections with the Ricoh GR II down on my knees in pouring rain to the amusement of the passing shoppers who must have wondered about this crazy guy who took photos of a puddle. I then flipped the image in Lightroom and worked a bit with curves, increased saturation and clarity. Danke schön und viele Grüße zurück ! Danke 😀🙏 das ist ja schon fast zu viel des Lobes 😉, aber definitiv Ansporn! Great shot, by the way! Thanks so much for taking the time to visit and comment! That is beautiful. And I love the story. Thanks a lot, Jessica! I appreciate your kind words! Oh, I just love this! I see why it’s your son’s favorite. Love it. Thanks, this means a lot ! Thanks 🙂 !!!! Gad you like it! Thanks so much, Sue ! Appreciate your visit and comment! Reblogged this on karla ewing. I love this shot! I myself am in a bit of a block at the moment…. my last midnight shoot went good but we haven’t seen the sun, nor the Northern Lights in weeks now. Everything is white and grey. I want to shoot the sunrise!! I want cooooold, as in minus 30°C. Thanks 😊! Just read in the paper that up north it is way to warm and the arctic winter ice is not properly building up…wish you the cold ☃️! I dream of seeing Nothern Lights one day !! !